Please note: The Sauna is only big enough for two people at a time, we do not offer lockers or showers. It is semi-private you are required to wear a swimsuit or clothing at all times. The Infrared sauna is a special detoxifying treatment that can help your body eliminate toxins you've already accumulated. This self-care treatment is relaxing and can help you feel good right away, while improving your health in the long run as well. The skin is the largest organ of the body & an important detoxification pathway. One way to stimulate detoxification through the skin by taking saunas. It not only helps clean your system but also gives you time to unwind & release stress. Getting a good sweat is particularly important during the part of the healing process where many people tend to lose weight. As you lose weight, your tissues release toxins bound in the fat, & sweating helps clear them out of your body. Besides detoxing, raising body temperatures helps fight infections & fungus; your body develops a fever for the same purpose. 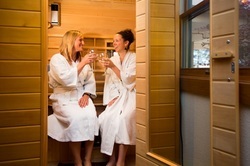 Far-Infrared Saunas have significant advantages over traditional saunas. Infrared light is part of the invisible spectrum of light & is capable of penetrating your body. The temperatures needed for an infrared sauna to be effective are lower than tradition saunas, so it's a more comfortable way to get even deeper results. They are also reputed to promote dilation of the capillary microciruclatory system, improve lymph flow, & relax muscle fibers. This reduces spasms & soreness in addition to the detoxification benefits. Our infrared sauna is located in Tahoe Vista, CA across from beautiful Lake Tahoe and only a short drive from Incline Village, Kings Beach, Northstar Ski Resort, Squaw Valley USA and Tahoe City in the North Lake Tahoe area.